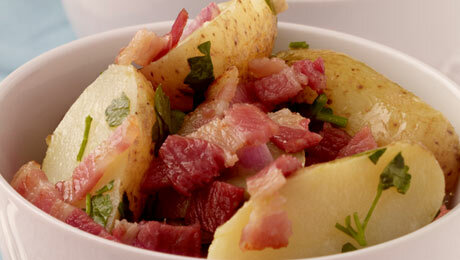 A different take on classic potato salad and so easy to prepare. Stir the vinegar, lemon juice, shallots and olive oil together well to make the dressing. Drizzle the potato quarters with the dressing and carefully shake the bowl. When cooled add the snipped chives and crispy bacon lardons.